The basic unit of striated muscle tissue is known as a sarcomere. 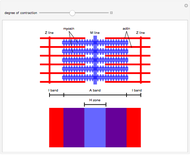 Sarcomeres are repeating units aligned along a muscle fiber, delimited by the Z lines, as shown in the diagram. 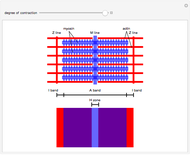 When a muscle contracts, the sarcomere shortens as the Z lines are brought closer together. The two main filaments involved in muscle contraction are composed of actin, the thin filaments, and myosin, the thick filaments. Notice the cross bridges on the myosin, which attach to the actin during contraction. The arrangement of these filaments in sarcomeres results in the striated appearance of muscle cells under a microscope. 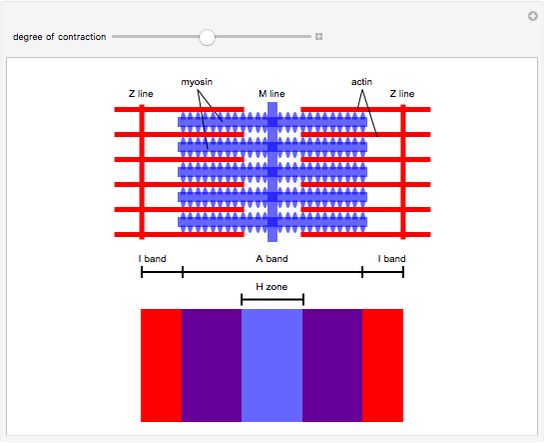 The I bands (or light zones) only contain actin, while the A band (or dark zone) contains myosin overlapping with actin. 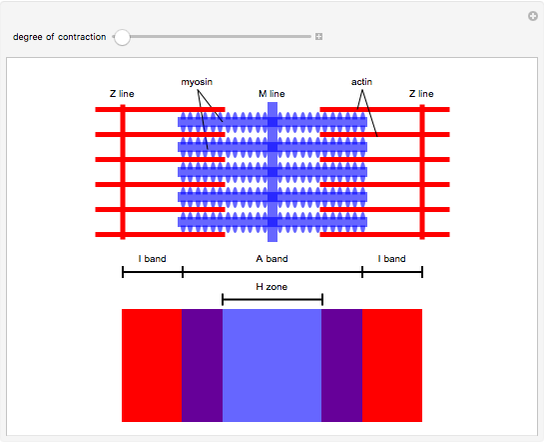 The portion of the A band where only myosin is present is known as the H zone. Initially, scientists believed that the actin and myosin filaments themselves shortened during contraction. However, later studies under the microscope showed that the length of the A band remained the same throughout contraction; only the I bands were shortening. This resulted in the formation of the sliding filament theory of muscle contraction, which states that myosin and actin slide past each other during contraction. As the myosin cross bridges pull the actin filaments closer together, the overlap area between myosin and actin increases. This would result in shortening of the light zone, but since the myosin filaments do not move anywhere, the dark zone stays the same length. 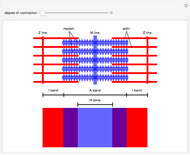 This Demonstration simulates this model of muscle contraction. W. Kapit and L. M. Elson, The Anatomy Coloring Book, 4th ed., San Francisco: Pearson Education, 2014. 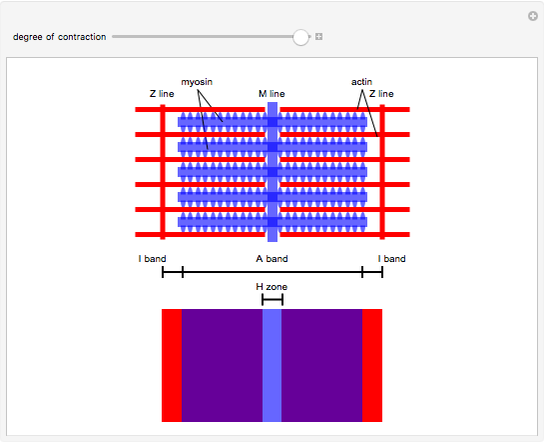 Stephanie Hu "Sliding Filament Model of Muscle Contraction"